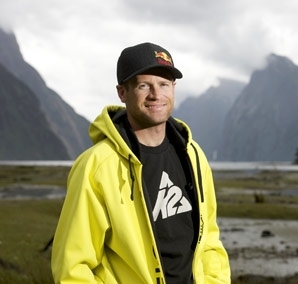 The skiing world lost a legend, and I lost a friend this year when Shane McConkey died in a ski base accident when a ski did not release. Shane released the ski, unfortunately not with enough time to release the parachute to break his fall. In his lifetime Shane had won almost every different event you can win on skis - moguls, big mountain competitions, big-air titles, and skiercross races, before taking up ski base jumping, but he also was the first to conceive of reverse camber, reverse sidecut skis, an invention that rocked the ski industry. You’ll also find his name on a ski run at Whistler and a lift at Park City. Ski-basing evolved from the fusion of base jumping and catching big air while skiing. It started allowing skiers with base jumping experience to ski faces once never skied because they ended in huge cliffs. The minimum cliff height required to safely open a base chute is about 200 feet, with no maximum. I asked Shane what pushed him to start ski-basing, and he explained that he still loved catching big air while skiing, but as he grew older it was harder on his body and recovery from injuries took much longer. With ski-basing he could go a thousand times bigger with no impact to his body--the only downfall was there would be zero room for error. Many have felt that his adventures were crazy or he had a death wish; this could not have been further from the truth. It was a simple need that all adventure athletes share, to push one’s physical and mental limits in hopes of getting to know themselves just a little bit better. The reason why Shane was so widely loved and respected had nothing to do with the fact he was the greatest freeskier of our generation. It lay in his ability to always laugh and never take his fame or himself seriously. He was always laughing, while caring deeply for his family and friends. I miss my friend very much, but understand that his memory and spirit will live on through every person who ever crossed his path or has been inspired by one of his adventures. His legacy will continue by fueling the flame of the next generation of big mountain and adventure athletes. Shane made skiing attractive again to America’s increasingly snowboard-leaning youth. He is the biggest reason why skiing found its roots again—making it cool for the next generation with one simple rule: Have fun and don’t be afraid to laugh at yourself. Shane’s humility was inspiring and his presence was intoxicating. I am a better man today for having known you, Shane!